Four months later, this mission was compromised by threats, arrests and financial constraints for reporting on government corruption. It was not the first time Azadliq experienced economic pressure from its government-backed distributors under Azerbaijan’s now four-term leader, Ilham Aliyev. Aliyev has long faced accusations of authoritarian rule and suppressing dissent since taking office in 2003. But months of fines surpassing £50,000 and mounting arrests overwhelmed the paper, which suspended its print edition in July 2014. Among other members of civil society and the independent media, Haciyev’s colleague, columnist Seymur Hezi, remains imprisoned for “aggravated hooliganism” after defending himself from a physical assault. The public’s widespread protest went unheard by the government. As of this year, Reporters Without Borders’ Press Freedom Index has documented that 165 journalists are currently imprisoned in Azerbaijan. Monthly, the Mapping Media Freedom database features reports on the former Soviet republic’s assault on dissenting speech. In July 2018 alone, MMF documented four opposition websites blocked by the government for spreading misinformation, two editors of independent news outlets questioned by authorities and one journalist arrested for disobeying the police. 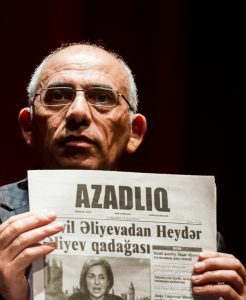 In December 2017 a high court in Azerbaijan upheld the blockage of five independent media organisations’ websites, including Azadliq.info, active since March 2017. Haciyev criticised this move as further inhibiting the Azerbaijani people’s ability to access objective information. Haciyev spoke with Index’s Shreya Parjan about the ongoing situation. Index: Is Azadliq alone as a target? Why was the publication perceived as such a threat to the government? Hajiyev: We can not say that only Azadliq was subjected to repression. Azerbaijani authorities are very corrupt and cannot tolerate criticism from their opponents. The corrupt and repressive regimes around the world suppress freedom of speech. In this regard, the Azerbaijani authorities, especially in recent years, have been in the ranks of the world’s most repressive. Index: What ultimately made you decide to leave Azerbaijan and how difficult was the process? Hajiyev: The newspaper ceased its operations in September 2012. The authorities have not allowed Azadliq to be published. At that time, they left the site of the newspaper. I stayed in the country for some time. I regret that I had to leave the country after the very strong pressure of the authorities. My colleague continued to lead the website and the Facebook page of the newspaper. Of course it is a difficult process. To be forced to leave the country [is a] very unpleasant affair. I had to endure a lot of trouble. Nevertheless, I continued the business. Index: While in exile, how have you been able to continue your work and advocate for change? Hajiyev: At this time in exile, I continue to guide the website and the Facebook page of the newspaper. Being outside the country, I actively use social networking. On the one hand, I gather information, on the other hand, I distribute it. Social networks help organise and conduct work. Our Facebook page is one of the most popular in the country, and I am proud of our achievement. Index: Could you identify any supportive communities you have encountered with while in exile? What obligation do foreign journalists have to collaborate and support one another in times of crisis? Hajiyev: Communication between journalists who are abroad is important. To share experiences and information would be useful. It would be very nice to be able to communicate work by local journalists. Index: How does the crackdown on digital freedom oppose the government narrative of a modern, free Azerbaijan? Hajiyev: In Azerbaijan, there is a political regime that strongly suppresses freedom of speech. According to the index of freedom of speech, composed Reporters Without Borders, Azerbaijan occupies the 163rd place. Azerbaijan is currently undergoing one of the most difficult times in its history. The rights and freedoms of citizens have long been of nominal character. There are now more than 160 political prisoners.